Employed after all - Stowarzyszenie Młodzieżowych Inicjatyw Twórczych "CREATOR"
co-ordinated by OTI-Latvia and held in Sigulda, Latvia. With the economic situation all over the world finding employment is far more difficult for our youth today and those thinking of starting their own business have even more difficulties. Our project aims to see how our young people see these difficulties and how they can find solutions to their employment problems. The project will include partners from a large variety of member states to increase the European dimension of the project so that young people can share their knowledge and experiences with regard to the topic. We will investigate cross border employment and also cross border trading. We will look at the options available to young people to start their own businesses and also look at the knowledge and skills they have to be able to start their own businesses. that we face. Each country will present the problems in their country and this will allow the young people to learn from the experiences of others and other countries. Working in groups for various activities will allow the participants to learn the importance of teamwork and show how working in groups may increase our success rate. The project is open to all young people ages 18 to 30 who are either having problems finding employment, or starting a new business and young people who have businesses of their own to share their ideas and concerns. The "Youth in Action" Exchange "Employed after all" was held in Sigulda in Latvia from 01. 08. 2013 till 09. 08. 2013 . Sigulda is a small city situated near to the Capital of Latvia-Riga. This was a place were participants from five different countries - Poland, Cyprus, Romania, Latvia and Spain-met. The main subject of the project was unemployment especially among young people. The activities were run by Cyprus Trainer who was well prepared to all of them. During the classess we were talking about the problems of unemployment in our homecountries and about Tools for employment in our countries. We weight the topic of cross-border employment from our point of view up .We were disscussing about advantages and disadvantages of working abroad. Moreover, we talked about European Voluntary Service and enormous opportunities for experience that bring us. One of our topics was also EURES- a website which helps people to find work abroad . One of the most interesting activities were concerning social media and how we can use them and take advantage of them. One of our tasks was to design our Facebook profile to make it look like our virtual CV. As far as I'm concerned the most useful topic refer to how we should write our CV and Cover Letter. We were disscussing which details are the most essential to be put there and how make it eye-catching. In the end we wrote our own Cover Letter and Cv and individually disscussed them. During the project we had additional attractions such as trip to Sigulda and local places of interest like Sigulda Castle or Gauja National Park- the oldest National Park in Latvia. Another activity prepared for us by organisers was a City Game for us in Sigulda City Centre. Thanks to this we had a chance to meet local people. Everyday took place "Cultural Evening" which were prepared by every country. It was a great opportunity to get to know culture, language and traditional food. I had an amaizing time in Sigulda and it was a great experience for me. I am looking forward to next "Youth in Action" exchanges ! “Employed ever after” was a youth exchange founded by the Youth in action Programme among 5 countries: Spain, Cyprus, Romania, Poland and Latvia. The host country was Latvia and the project took place in Sigulda. The main goal of the project was to integrate and discuss the issue of unemployment as well as finding ways making young people more attractive for employers. Everyday the members took part in various kinds of pursuits and classes. In the morning there were tasks connected with global job market. We worked over the problems in international groups and tried to present each problem from a perspective of our own countries. What is more we tried to find both solutions to the problems as well as the main causes of them. Working in the international groups helped us to exchange ideas and experience among each other. In the afternoon we had classes during which we tried to find solutions to the problems which were discussed in the morning. To have our classes more creative we had a lot of games and tasks such as: “Find a job”, “Work and live” “creative business”. Every evening we had so called “ a cultural night” during which the participants of the exchange in the form of quizzes and games made us more familiar with their own countries. The games were mostly connected with traditional aspects and interesting facts. At the end of every presentation we had a chance to taste local food and drinks. At begging of August I have participated in project Employed ever after in Sigulda, Latvia. The main aims of this projekt was to discuss problems that young people have while trying to find a job, possibilities that EU is giving them and giving us tips how to sell ourselves while searching for a job. Projekt had participantes from Poland, Latvia, Spain, Cyprus and Romania. Besides main goals of projekt it obvious upside was getting to know new cultures of know people and their point of view. It have given me an opportunity to practice my English and get to know some basic phrases in languages of other participants. I have met a lot of great people and i’m hoping to stay in touch with them. I recommend taking part in similar projects. From 1st to 9th of August 2013 in Sigulda, Latvia there was held a project ‘Employed ever after’. In this project participated teenagers from 5 countries: Spain, Cyprus, Romania, Latvia and Poland. The project proceeded according to the presented earlier schedule. Very often we worked in international groups what gave us a chance to exchange our viewpoints and knowledge about various subjects. The leader was really well-prepared, he possessed huge knowledge and shared this knowledge with us. During the project there were discussed issues connected with unemployment, why is it so difficult for young people to find an employment, how to write a good CV or how to set up own business. We discussed the phenomenon of unemployment in a particular country, how it is perceived by teenagers and what solutions of it can we find. We shared our knowledge and gained previously experience as part of us is employed. We considered the advantages and disadvantages of working abroad, salary and costs of living and other possible expenses. Various methods of work and games allowed us to understand the problems connected with unemployment but also duties of employees. Thanks to the activities and various games during this project we learned that the most important are cooperation, creating a team and pursuing to the same goal but also being creative. Made by us posters and other forms of work will stay for sure in our minds for a long time. We became aware that there are no bounds between us and other citizens of EU. What is more, we had a chance to get to know about the traditions and cultures of other countries. We exchanged our contacts and also became encouraged to take a part in other worthy projects. As a polish team leader I have taken part in the project “Employed ever after” held in Sigulda. The goals of the project were to analyze the difficulties arising to the youth with finding jobs, and to find solutions to those obstacles in a multinational environment. The project has had the attendance of almost 40 people from the following countries: Cyprus, Poland, Romania, Spain and Latvia. Apart from working during training sessions, the participants have had an opportunity to visit a cave, a nearby castle and a national park. Each evening was destined to the presentations about different countries and to sharing information about various cultures. I am enormously happy to know that the presentation delivered by the Polish team during the cultural evening was extravagant and has been highly appreciated by both, the organizers and the participants from other European countries. From my point of view, it definitely was an interesting experience. I can recommend participating in similar projects in collaboration with SMIT Creator. 01.08.2013 – 09.08.2013 in Latvian city Sigulda took place youth exchange “ Employed ever after”. The project was carried out in the framework of European Union program Youth in Action. Countries, which took part in a project are Poland, Latvia, Cyprus, Romania and Spain. The activities were conducted by a leader of Cypriot team – Mario. The subject matter of the project was unemployment among young people. The first day we spent mostly on travelling. We arrived in Sigulda in the late evening. After we had eaten welcome dinner, we had an opportunity to meet all participants of the project. During the second day we played integration and names games and established general rules of the project. Moreover, the coordinator presented us basic information about the project. During the next days we were working in international groups on the problems, which young people come across while they trying to find a job and how we can increase our chances on the labor market by European Voluntary Service. Thanks to one-day trip to Sigulda we could visit surrounding historical treasure and a game park. This helped us to break new ground on the role of social media on the contemporary labor market. Advice and hints, which were given by Mario made that now every participant of this youth exchange know how to run his or her facebook profile and how to write correctly a CV and cover letter. 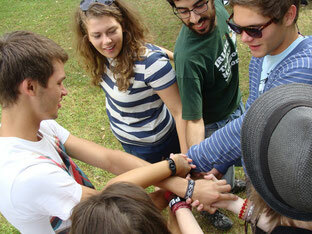 What is more, during workshops each group had an opportunity to create their own project of youth exchange. I firmly believe that most of this project will come to a realization in future because ideas presented by participants were great. Furthermore during workshops we were talking about programme that can help us to enhance our CV, how to get work experience, how to behave on work interview and about working abroad. At the end of the project we played a simulation game, in which we could use the knowledge, that we had acquired during the exchange. What is more, every evening were organized national evening. Thanks to them we could know better the culture of countries, which participated in the exchange and taste traditional cuisine. Various approach to the subject of unemployment among youth and activities, which aim was to understand better other cultures made that everyone could learn a lot of interesting things and broaden their knowledge and meet many interesting people.